Just because I had to start another project.... 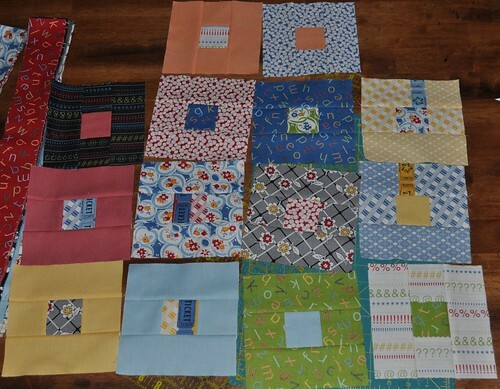 I got a Punctuation/American Jane jellyroll a couple weeks ago and saw a quilt made from these blocks and haven't been able to get them out of my mind. They go together so fast! I made 10 of these in less than an hour this morning. Each block is just three 2.5" squares and 2 strips that are 6.5" x 2.5". I love the tickets. 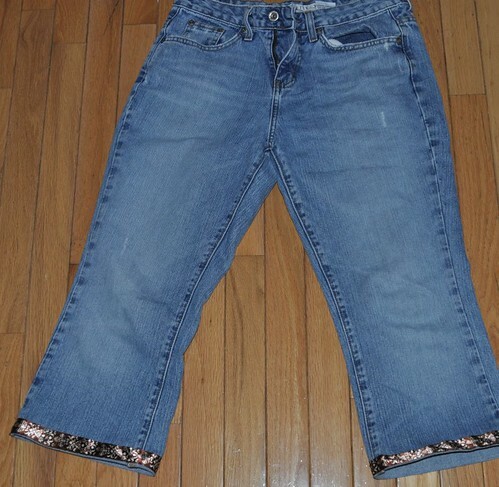 These thrift store jeans were too long and too flared so I cut them off and hemmed them with ribbon. It only took about 20 minutes to sew the ribbon on. Do you want me to make a tutorial for how to do this? I finally got some fusible stuff and eyelets/grommets so I can make the ABC book from Moda Bake Shop. I have the letters and batting cut, I'm ready to go! Nice job on the jeans, and I like the blocks also. Cute blocks out of the Punctuation!